Physical characteristics: Eurasian golden orioles are covered with a golden color except for black wings, tails, and a stripe through the eyes. Females are duller than males with a greenish back. Geographic range: They range in Europe and far northwest Africa east to Asia Minor, the Caspian Sea, western Siberia, and, in winter, sub-Saharan Africa; Central Asia, from western Siberia south in winter to Afghanistan and Himalayas, peninsular India, and north Sri Lanka. Habitat: Eurasian golden orioles prefer woodlands and open forests of mostly broadleaf and deciduous mature trees. Diet: Their diet consists of a variety of insects including hairy caterpillars and a range of small fruits, some seeds, buds, small reptiles, nestling birds, and eggs. They feed from foliage at the tree crowns but also hover near the ground in search of food and perch on branches and fly to food when found. Behavior and reproduction: Eurasian golden orioles are solitary birds. They stay in the upper areas of trees. Songs that are sung all year round, but more often by males than females, is a loud, warbled whistle of three or four syllables that is repeated and sung in different ways. When anxious, they give out a grating, drawn-out squalling. The birds are monogamous. Females produce one brood each year. Males defend territories. The nest is built in the shape of a shallow cup, using plant fiber and stems. It is hung over a thin horizontal fork in high foliage. Females build it, with some early help by her mate, usually in six to twelve days. Females lay three to four creamy or pink-white eggs that are scattered with dark brown and blackish spots. 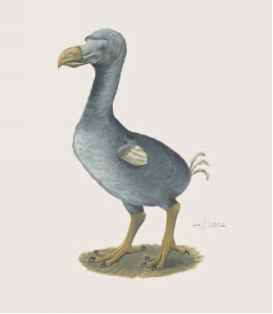 The incubation period is fifteen to eighteen days, and is performed by the female with assistance from the male. Both parents feed the young and sometimes helpers feed them, too. The fledgling period is sixteen to twenty days. Eurasian golden orioles and people: People in northern Europe like to predict the coming of spring with the arrival of Eurasian golden orioles. They also like the golden plumage and fluted song of the birds. "Eurasian Golden Oriole." Haryana, India, haryana-online.com. 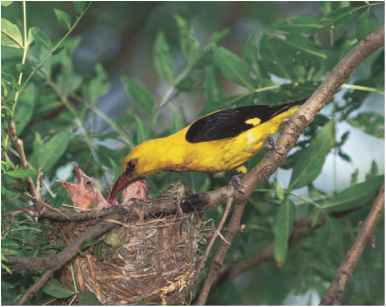 http:// www.haryanaonline.com/Fauna/Birds/eurasian_golden_oriole.htm (accessed on July 20, 2004).